Happy basket arrangement, made in shades of cream, yellow and peach. Flower arrangements are a combination of several elements to produce a visually pleasing display of fresh flowers. Flowers are usually arranged in several basic designs, including vertical, horizontal, triangular, crescent, and oval arrangements. 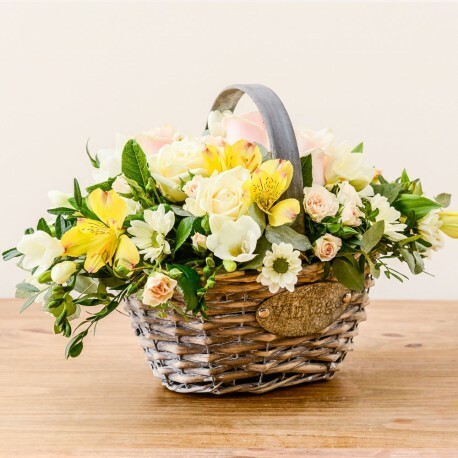 Other options include a minimal arrangement and basket arrangements. using a range of containers we can make your arrangement perfect.